Copyright © 1995-1997 Balmoral Software (http://www.balmoralsoftware.com). Portions copyright © 1995 Discis Knowledge Research Inc. All rights reserved. Republication, redistribution or conversion is expressly prohibited without the prior written consent of Balmoral Software. To skip the introduction, click the left mouse button after the falling-jewels animation begins. A puzzle may be reset by clicking on either horizontal bar next to the oracle triangle at the top of the screen. To quickly return to the altar after solving a puzzle, ctrl-right click on the jewel at the top center of the screen. 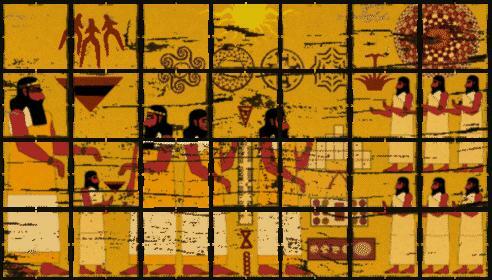 When a group of four puzzles is solved, return to the well and click on the water-filled stone for animation and an oracle message. The game desperately needs an Undo button during puzzle solutions (e.g., one false move with Bug Ball or Peg Solitaire and you have to start all over). (without overlap) using the digits 1-9 left to right. Drag the icons to their respective places at the top of the display. In Hard mode, there are seven blanks to be filled, in Easy mode, three. This problem is very difficult even using "obvious" object pairings (e.g., brush/comb, hammer/chisel) since there is no feedback given for correct pairings prior to a complete solution. If f(N) denotes the number of possible pairings that can be made from N distinct objects (N even), without regard to order among or within object pairs, then first note that f(2)=1. Also, f(N)=(N-1)*f(N-2) since the first of N objects can be paired with any one of the remaining N-1 objects, and the remaining N-2 objects can be paired off in f(N-2) ways. The solution to this difference equation is f(N)=(N-1)*(N-3)*...*1, and in particular, f(12)=11*9*7*5*3*1, or 10,395 possibilities for this puzzle's outcome. If two pairings are known in certainty, the remaining possibilities number 105 (or only 15 if three pairings are known). Clues from the Jewels of the Oracle website suggest looking for objects in the Memory of Bhandam (Blind Jigsaw) and Sowing Seeds (Mancala), but the only object found was a sickle in the latter location. This challenging "warehouse" puzzle desperately needs an Undo button in case of an inadvertent move (for example, moving any ball into a corner prevents it from ever being moved again and so prevents a complete solution to the puzzle). Apparently there is no "no more moves" message when all possible plays have been made without a complete solution. Keyboard arrow keys may be used to orient or move the bug. The bug can move only one ball at a time and can only push it from behind. The initial arrangement of 29 balls is shown by the letters A-Z,a,b,c in Figure 1. The bug starts at the asterisk at the upper left, and balls are disposed of into the hole indicated by an asterisk at the bottom center. This completes all balls in the left region. Note that this region is separate from the right region since a ball cannot be moved through corners in the connecting tunnel and the bug cannot jump over the disposal hole. The initial arrangement of 19 balls is shown by the letters A-S in Figure 3. The bug starts at the asterisk at left center, and balls are disposed of into the hole indicated by an asterisk at lower center. Complete bug control sequences are given (U: Up, D: Down, L: Left, R: Right). Click on the left shelf to obtain a Hassuna piece. The Hard and Easy modes of this puzzle appear to be identical. Click on the small rock to obtain a Hassuna piece. Click on the large rock to access the puzzle. To solve the puzzle, exchange the positions of the green and yellow pieces. Click on a pole for an animation. Click on the back wall for the puzzle. 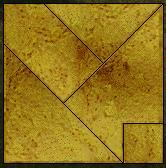 In order to reach a solution, tiles must be exchanged (by dragging) - rotations alone will not suffice. 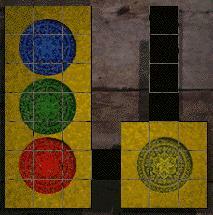 In Easy mode, tiles are exchanged (by dragging) - no rotations are necessary. When you have landed on a square showing N, in the next move you can move exactly N squares in any of the four cardinal directions as long as you don't move off the board. Click on the horse stall to obtain a Hassuna piece. Click on the sickle for an animation. A bell ring means you have ended a move at the right-hand bowl (Ruma) and may select any starting bowl for the next turn. Otherwise, you must begin the next turn from the bowl at which you ended the last move. Move the blue ball with an arrow key held down. Capture two yellow crystals on opposite cube faces (Hard mode), or a single yellow crystal on the first face (Easy mode). There are 12 pentominoes of each color. They do not comprise the standard set of pentominoes in which every possible combination of 5 component squares is represented; for example, the standard pentomino with 5 squares all in a row is excluded. One shape is duplicated. Click on the top of the yellow chest to obtain a Hassuna piece. The Hard-mode puzzle is a blind jigsaw in which only one piece can be seen at a time. The pieces are jumbled differently each time, but the target picture remains the same. 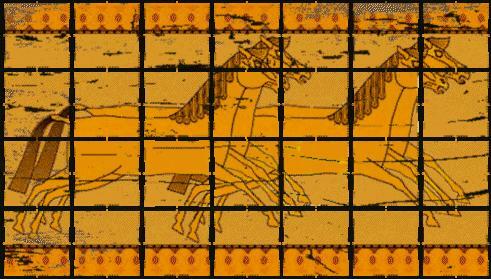 A sketchy representation of the target picture can be seen on the right-hand wall in the room containing the Pentominoes puzzle. The puzzle allows no more than two balls per wheel. Wheels rotate pairwise in opposite directions. The puzzle is randomized for each invocation, but is kept the same after a reset. This symbol ordering is repeated on each panel. Assuming panel arrangements in the middle of a turning operation do not have a bearing on the final solution (i.e., all that matters is the panel arrangement after all panels have finished moving), then only six distinct operations are performed by each control rod. This simplification results from the fact that moving the left side of a control rod N times is equivalent to moving its right side 6-N times, and the fact that the same symbols are on each panel in the same order. The total number of possibilities thus is 6^6, or 46,656. A solution to most randomized initial panel positions may be found by using a computer program that checks all possible rod motions. If no solution is found, a more solvable initial position may be generated by restarting the puzzle. In Easy mode, making all panels identical yields a jewel. Enter the balcony. The puzzle will appear after a couple of clicks on the city map. If you click on the map houses in the indicated order as soon as the map is displayed, an animation moving through the center of the model city is played. This area of the city is the same as that to which you are transported at the end of the entire game when all puzzles have been successfully solved. Click left to display a box. Click on the box to obtain a Hassuna piece. The Easy puzzle is identical to the Hard puzzle, with answers for the Hexagon and Star given. In Hard mode, there are 39,816 distinct solutions. Click on the rod for an animation. Click on the right-hand side of a square to increment it, on the left-hand side to decrement it. In Easy mode, the even-numbered entries are given. The objective of this puzzle is arrange equal amounts of water among the tanks along each of the three walls. Tank sizes are fixed, but water quantities are randomized each time the puzzle is reset. Add up three water quantities Q1, Q2 and Q3, each consisting of four tanks along one of the walls. The difference between Qi and the average (Q1+Q2+Q3)/3 (usually 15) determines how much water is needed or is surplus between tank groups. Transfer water between the tanks along one wall to set up the necessary empty region(s). The Hard and Easy modes of this puzzle appear to be identical, but the Easy mode may provide water quantities that are simpler to apportion. Sliding-block puzzle, with five open spaces and a connected-region layout. A useful strategy is to work the puzzle top to bottom, left to right (but complete the lower row first). Reserve an open space at the current destination to make final positioning easier. Use other open spaces to rotate pieces around rectangular cycles. Jewels are reformed in a flash of white light. If no puzzles have been forfeited, wait for the rotating shard to appear at the top of the screen. Return to the Kavi section of the pool and click on the water-filled stone. Move to the Krida section of the pool and click on the triangular shard at the top of the screen. Then click on the pool ripples. This takes you through the empty well and into a city building on the surface. To display game credits, click on the stone block in the center of the city square. A save game text file from a game in which most puzzles have been solved may be converted into a form yielding the complete endgame by changing the last parameter in the setJewel() reference from "I" or "D" to "V" for each unsolved puzzle (see the next section for a list of internal puzzle indices). Then, after loading the revised save game file, visit each unsolved puzzle and ctrl-right-click on the displayed jewel to insert it into the altar diagram. The two forms of the endgame oracle message can be displayed using the QuickTime for Windows viewer PLAYER.EXE in the Windows directory on the files \video\hqvideo\wellroom\07*.mov found on the CD-ROM.